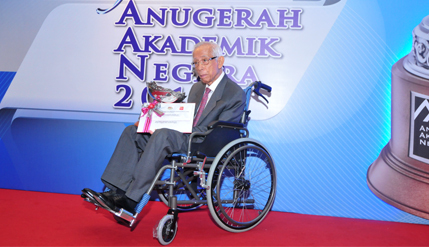 PUTRAJAYA, 2 September 2014 – The first Vice Chancellor of The National University of Malaysia (UKM) and the man acknowledged for setting the foundation of its development, Prof Emeritus Tan Sri Dato’ Dr Mohd Rashdan Baba was today bestowed the National Academic Award. Prof Rashdan together with Tun Dr Mahathir Mohamad, Tan Sri Abdullah Ayub, Tun Syed Nasir Ismail and Dr Agoes Salim, were at the forefront in the establishment of the university to enable students from Malay medium schools to continue their education up to the tertiary level. UKM was thus started in 1969 to be the custodian of the national language at the university level with Prof Rashdan appointed as its first Vice Chancellor in Sept 1969. Malay was made the medium of instruction with the aim of developing it into a language of knowledge. His wish then was to also see UKM become a world class university. At that time UKM was viewed as a second class university because Malay was made the medium of instruction. Prof Rashdan had then also faced problems in getting his teaching staff as not many reputable professors and lecturers want to join the university then. To help solve the problem he encouraged UKM teaching staff to continue their education providing them with scholarships and taking in lecturers from a number of reputable universities in Indonesia who can teach in Bahasa Melayu. Today UKM has more than 270 professors getting visiting professors including noble laureates from all over the world. He worked tirelessly to ensure that UKM is a success and a force to be reckoned with. Thus the foundation set by Prof Rashdan has led UKM to be one of the reputable universities in the world while upholding the national language. Prof Rashdan went on to be made the founding Vice Chancellor of Universiti Pertanian, now University Putera Malaysia (UPM) which was upgraded from the Agricultural College in 1971. The award was presented to Prof Rashdan by Prime Minister Datuk Seri Mohd Najib Tun Razak.